Open the Weekly Calendar by clicking the Weekly Calendar button the Executive Dashboard. Filter the calendar if necessary using the Change Criteria button. 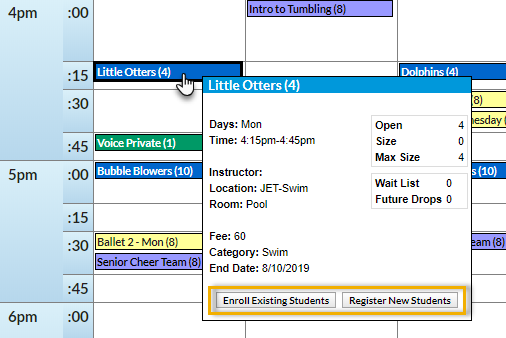 Hover your cursor over any class to open pop-up class details. If enrolling a new student, click the Quick Reg button. Follow the Enroll a New Family/Student with Quick Registration/Add Family instructions. If enrolling an existing student, click the Enroll button. Follow the Enroll an Existing Student from the Class Record instructions.